Joannes Nigronus. Oratio Nigroni iureconsulti habita Genue du[m] Pa[n]thaleone[m] Siluaticu[m] vtriusq[ue] iuris ornaret insignibus. [Pavia]: Impressussum Papie p[ro] magistru[m] Jacob de Burgofrancho, 1509. The Oratio was delivered to celebrate the award of the doctorate to Pantaleone Silvanicus, likely from the first European university, Studium Bononiensis (University of Bologna), an institution central to the development of Roman law. It has been suggested that Pantaleone Silvanicus may be Pantaleone Giustiniani, a distinguished Hebraist, canonist, and contemporary of Erasmus. 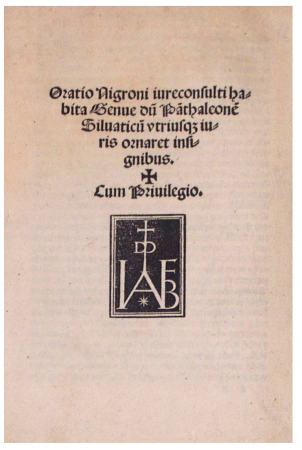 The Oratio, in which Negroni commends Pantaleone for his superior knowledge of both Roman and canon law, comprises a historical survey of civil and public law. Emphasizing Roman law, Negroni also provides a detailed analysis of the relationship between the people and institutions under both republican and imperial governments, and in this brief work manages to summarize a long span of legal history. This dissertation of eight unnumbered leaves is a fresh copy bound in later limp vellum. Its title page bears the device of Jacobus de Burgofranco. The work is extensively annotated in a contemporary hand.